Qatar Airways brought its participation in the Arabian Travel Market (ATM) 2017, the region’s largest travel show, to a successful conclusion by revealing a host of new destinations, showcasing product innovations and displaying the airline’s new Business Class Qsuite for the first time in the Middle East. A number of exciting announcements were made by Qatar Airways at ATM, including the launch of the new high-speed broadband partnership with Inmarsat (GX Aviation), as well as plans to introduce a fifth daily non-stop service from Doha to Bangkok, a Memorandum of Understanding (MOU) with the Tourism Authority of Thailand (TAT) signed to boost tourism between both nations, and the launch of the airline’s redesigned website set to go live in May. Significantly, H.E Mr. Al Baker also revealed a host of new destinations the airline will launch in 2018: San Francisco, U.S; Cardiff, United Kingdom; Utapao, Thailand; Chittagong, Bangladesh; Mykonos, Greece; Málaga, Spain; Accra, Ghana; Lisbon, Portugal; Abidjan, Ivory Coast; Prague, Czech Republic; Kiev, Ukraine, and Mombasa, Kenya. On day one of ATM, H.E Mr. Al Baker hosted a packed press conference followed by an unveiling ceremony that revealed the highly-acclaimed new Business Class Qsuite for the first time in the Middle East before international media, travel trade leaders, industry representatives and VIP guests. H.E Mr. Al Baker welcomed and gave a tour of the Qsuite to industry leaders and dignitaries including His Highness Sheikh Mohammed Bin Rashid Al Maktoum, Vice President and Prime Minister of the United Arab Emirates (UAE) and Ruler of Dubai and His Highness Sheikh Hamdan Bin Mohammed Bin Rashid Al Maktoum, Crown Prince of Dubai. Thousands of visitors experienced Qatar Airways’ renowned hospitality at its impressive two-storey stand, while exploring the potential to travel the world through the airline’s network of more than 150 destinations. Qatar Airways was named ‘Airline with the Best Business Class’, and the ‘Airline with the Best Cabin Crew’ on the eve of Arabian Travel Market at the prestigious Business Traveller Middle East Awards 2017. The awards are based on votes submitted by the readers of Business Traveller Middle East, and add to the international recognition and the growing list of accolades the carrier has received. The airline currently holds the title of World’s Best Business Class as awarded by Skytrax in 2016, and its Doha hub, Hamad International Airport (HIA) was also recently honoured with five stars at the Skytrax World Airport Awards and was ranked Sixth Best Airport in the World. 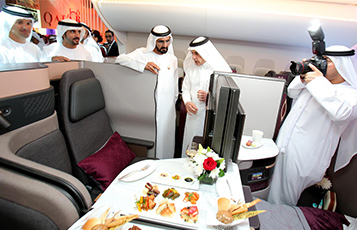 Qatar Airways is the national carrier of the State of Qatar, and is one of the fastest growing airlines operating one of the youngest fleets in the world. Qatar Airways has a modern fleet of 195 aircraft flying to more than 150 key business and leisure destinations across six continents.